Students who choose the physics education major will combine science courses with education courses to prepare for teaching middle school and high school students. You'll work closely with the physics department and School of Education advisers from the beginning to ensure completion of the right combination of courses to earn the teaching license. Along the way, you'll have access to St. Cloud State's advanced research labs, planetarium and faculty research. You'll learn how to design curriculum and lab work that will engage your students and build their interest in science careers. 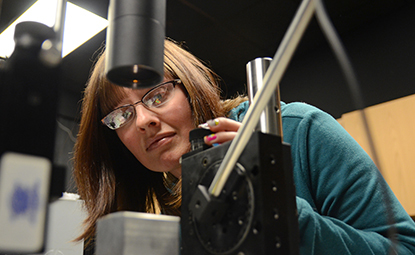 State-of-the-art lasers available for curriculum and research. School of Education accreditation by National Council for Accreditation of Teacher Education (NCATE). All teaching licensure programs approved by the Minnesota Board of Teaching. New laboratories in the recently opened 100,000-square-foot Integrated Science and Engineering Laboratory Facility (ISELF). NASA will send a device designed by physics professor John Harlander into orbit as part of a 2017 Explorer satellite mission.